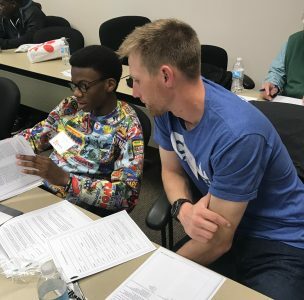 I’m proud to be one of the mentors in the C-10 Mentoring & Leadership program through Royals General Manager Dayton Moore’s “C” You In The Major Leagues Foundation. C-10 is a life-changing program for high school students. Through the weekly program with C-10, we’re helping the students develop life skills, job skills, work on ACT prep, and tackle a monthly service project. All of these things are helping them become better servant leaders today and for the future. My mentee, Sidney, is one of the youngest students as a freshman, but he’s extremely intelligent with some big dreams. He loves baseball and is a talented musician, but he wants to go to college one day and become a cartoonist. All 10 students in the program have those types of dreams. Dayton Moore and the foundation have big dreams of their own when it comes to C-10. Will you help us reach our goal?